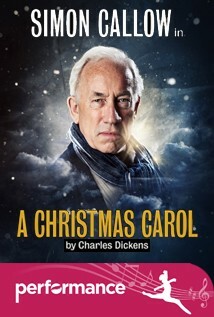 Simon Callow returns in this much-lauded production of ‘A Christmas Carol’, playing at the Arts Theatre. Intensely dramatic and profoundly heart-warming, this is one of the greatest ghost stories ever written and storytelling at its very finest. Using the adaptation Dickens made for his own public performances, Simon Callow and director and designer Tom Cairns have conjured up a moving, funny and fast-paced one-man theatrical spectacular that will leave you with a warm festive glow. Dickens takes us on a man’s astonishing journey through his past, his present and (terrifyingly) his future, led by his three ghostly guides. ‘A Christmas Carol’ has become a classic Christmas tale for generations of grown-ups and children alike. Brought to life by the magnificent Simon Callow, this is a Christmas must see for 8 to 108-year olds! 90m.